Have Humans Evolved to be Violent? 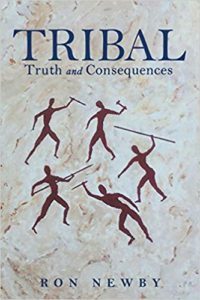 Ron Newby, a former researcher at the Salk Institute in La Jolla, begins his book Tribal: Truth and Consequences by quoting mathematician Jacob Bronowski on the uniqueness of humans among animals. Tribal is an 82 page discussion of what drew humans into groupings and what effect this has had on human evolution and what are the future prospects for humans. The book is uneven though. For example, Newby considers boys liking guns and girls liking dolls to be instinctual behaviors. (p 15) He provides no definition of instinct, but generally an instinct is considered by psychologists to be an unlearned, automatic, and fixed behavior. Thus instinctual hardly applies to liking guns and dolls. On p 16 Newby writes, “There are likely genetic factors that influence our killer behavior, however there have been no killer gene or genes that have been linked to our proclivity toward killing.” [italics added] By writing with the pronoun “our,” Newby conveys the impression that killing, or the tendency toward killing, is widespread among humans. But this is clearly a marginal behavior. One calculation was that murder was accounted for by 0.0046% of Americans in 2013, and such a percentage may be even lower today. Moreover, the fact that soldiers having experienced violence or death on the battlefield incur PTSD speaks against a widespread proclivity toward violence; rather it would posit an aversion toward lethal violence. Newby first and foremost states that tribalism offered the advantage of security from outsiders. (p 17) Companionship and pair bonding are mentioned thereafter. (p 18) Hence, a bias appears in Tribal, that of humans being naturally violent. The book, however, finds its footing in the middle section when it discusses the neurochemical and biological bases for behaviors. Newby then segues into the profoundly important topic of the danger facing humanity from anthropogenic climate change. Everyone should be informed on the topic and what the ramifications for current and future generations might be. The author pontificates that conspiracy theorists are tribe creators “by offering alternate explanations of events, rather than accepting the reliable and tested theories. Prime examples would include the deniers of the Holocaust — (never happened), deniers of the accepted cause of 9/11 — (It was Israel)…” (p 26) First, who denies that the Nazis rounded up communists, Jews, Roma, homosexuals, etc into concentration camps where many people perished? I am aware of people who question the widespread narrative of the numbers and the method by which prisoners died. I am unaware of people who deny that there were concentration camps and that people died there. Second, I wonder what the author considers to be the “accepted cause of 9/11”? Newby does not state this. Apparently Newby denigrates the over 3,000 architects and engineers who call for a new investigation into the events of 9-11 as conspiracy theorists. In addition, over half of Americans doubt the “official” explanation. Newby fails to grasp that knowledgeable people can posit legitimate theories based on evidence and logic counter to the “official” theory solicited by the George W Bush administration. Such theories may be incorrect, but so might also be the “official” theory. A theory is not a fact. Third, resorting to ad hominem of contrasting views speaks ill of the mudslinger; it is unbecoming; and is not an argument worth contemplation. Newby intended Tribal as an unhindered read without the clutter of footnotes accessible to the everyday person. That Tribal is, but it consequently lacks depth and oft times left this reader wondering about the factual accuracy and logical coherence of what is being discussed. This article was posted on Monday, September 3rd, 2018 at 3:07am and is filed under Book Review.